Driving a four-way Drive Vehicles is fun, especially when you go on long trips or off-roading trips. The driving is more enjoyable when you have all the accessories for safety and comfort that makes your trip comfortable. Sometimes the vehicle gets stuck while off-roading due to rough terrains where you need the proper accessories to get it out of the situation. There are many accessories that you can use in your 4 WD vehicle for safety and comfort. However, one cannot install all the accessories on his/her car as it can increase the weight of the car. This post shares some essential accessories that you can fit on your 4-way drive vehicle. Today’s 4 WD vehicles have a non-protected front as they have an intercooler radiator, an AC condenser and some have a transmission oil cooler. All these essential components are located behind a thin plastic sheet known as the bumper bar. Even a little impact can break the plastic bumper and damage these critical parts. Bull bars are made up of plastic aluminium or steel that can reduce the impact on the vehicle in case of a collision. The aluminium and plastic bars are softer and lighter than steel, and that is important for small 4WD cars. 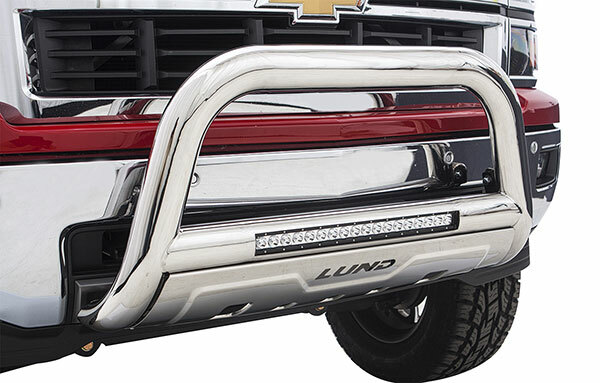 All these bull bars can save your vehicle; however, it is essential to comply with the state laws, as some countries have banned the use of bull bars. Your vehicle can be stuck in mud or a hole anywhere while off-roading. Sometimes the soil in the pit is too soft, and the tire rotates but cannot pull the vehicle out of the pit. The traction mats come in handy when the tires of your car are stuck in a hole. Put a traction mat under the stuck tire and accelerate a little while your vehicle is in the first gear. The traction mats are made to provide the required friction to rotate the tire and pull the car out of a pit. So never forget to carry the traction mats while going on a trip. When you go on long drives, the tires got heated, and the air pressure increases inside them. On the other hand, sometimes the air pressure decreases due to cold weather. The air pressure in your tires can increase or decrease due to any reason, and there is no guarantee of finding a service station or air pump on the way. It is best to carry a tie inflator and deflator to fill the air in your tires when it becomes low. Even you can use it to decrease the air pressure when you feel it is more than the required pressure. Maintaining the correct tire pressure is essential for the safety of the vehicle and getting the best mileage. Almost every vehicle comes with a jack, but you can get a high lift jack for your 4WD vehicle. A high lift vehicle enables you to lift your car at some more height than the standard jack. Moreover, you can use it for more purposes other than just raising your vehicle. You can use a hi-lift jack as a hand winch, clamper or spreader. You can lift your vehicle in the sand or life its wheel rather than frame or bumper. The suspension that comes fitted is made to drive your vehicle smoothly on the city roads and highways. Most car manufacturers don’t offer a suspension for off-roading. But if you are fond of off-roading, you will need special suspensions that can absorb the shocks on rough roads. Moreover, if you want to offroad, you should increase the ground clearance of your vehicle for improved safety. You can install the aftermarket suspension systems like the 4wd suspension lift kits Toowoomba to improve the shock absorbance of your vehicle. Some aftermarket suspension kits automatically increase the height of your vehicle to make it safe for off-roading. Upgrading the suspension system can improve the comfort while you drive in the off-road conditions. No vehicle is completely safe no matter what the manufacturer claims. Sometimes the vehicles catch fire due to overheating of the engine and sometimes due to unknown reasons. Carrying a fire extinguisher is essential for the safety in situations of fire. A fire extinguisher is useful not only for the vehicle fires but also for any external fires that you might encounter on your trip. Moreover, you must carry a first aid kit in your vehicle. You never know when you need it in case of minor accidents. The medications and other things in the first aid kit can save the life of a person before reaching a medical facility. These are some of the best accessories for your 4WD vehicle. The accessories like traction mats, high lift jacks and 4wd suspension lift kits Toowoomba can improve the comfort of your trip and help you to take your vehicle out from the unwanted situations.